In the early 1980s, I was smitten by a girlie white pup with pink floppy ears, pink paws and pretty pink sunglasses. She was the most adorable and glamorous dog ever. 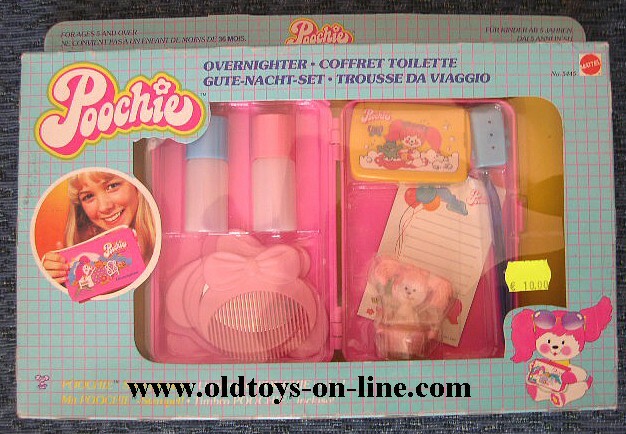 She went by the name of Poochie and the commercial had a lovely jingle that echoed "Pooooooochie, Poochie for girls!" Sadly that commercial doesn't allow embedding, so I couldn't include it other than including a link. Below is a different vintage ad just to give you a better idea of what Poochie toys looked like. Mattel packaged Poochie with me in mind. I loved pink and blue--those were true 1982-1984 colors, which was the Poochie heyday. I was a sucker for stickers and stamp pads. I had such a thing for any type of stationary item including note cards, envelopes, you name it. I had to have it. About ten years ago I purchased a few Poochie items on eBay. I'd love to own more, but until we buy a house, our limited space does not allow for collectibles. You get that house and when I decide to clean out all the vintage stuff, I'll send it your way! My sister had one of those. I had totally forgotten they existed. Thaks for stopping by! I LOVED Poochie! I am SO a child of the 80's. I miss all of the toys. I hate it when they try to bring them back becuase they are "updated". Like strawberry shortcake now wears jeans rather than the cute little dress! ugh! I don't remember her but she's so cute! When you going to get around to My Buddy and Kid Sister? Those are the money toys. Wow. These sure are cute and tiny. The Advertisement was a bit funny though! So are you saying a way to your heart is with a Poochie? I don't remember that toy. I don't remember Poochie. Perhaps I am too young. Maybe they weren't big in Australia. Damn. Seems like the commericals were a lot of fun. I was just thinking about this the other day. I had that Poochie for girls song playing in my head. I named my teddy bear Poochie in 1979-kind of a strange name for a bear. I wonder why I mentally blocked Poochie. I have no recollection of that toy every existing. Wow. That's a first for me. oh Ally, I completely forgot about Poochie!!!! and you are so right, pink & blue were definitely colors of the 80s and they were my fave. I really wanted a Poochie and never got one. Oh. My. God. Poochie, my beloved, we've been reunited! I seriously gasped when I saw this...hmmm, note to self - do not profess love of Poochie in public forum...I mean, yeah that's a funny old toy. I was born in '83 so sadly I don't remember ever playing with these. Sigh. They do look fabulous though!! Hahaha...I remember the poochie! How funny!!!! OH! Poochie! Where have you been?! I LOVE LOVE LOVED Poochie! Uh oh,...I'm in trouble now that I have an e-bay account. Oh that's so funny. I love looking back at all those 80's toys. Think I missed that toy by about 10 years, rats! I think I still have one laying around somewhere at my mom's house. My sister had a Poochie! Which sounds totally obscene, but she did and she loved it. I'm going to send her on over here. You're so great, Ally at filling me up with feel good nostalgia memories. Thanks! OMG!!! My heart is singing over this post! 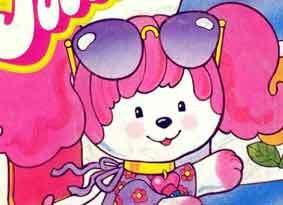 I LOVED POOCHIE!! I hadn't thought about her in YEARS. Thank you so much for the wonderful flashback. I might have to visit Ebay myself today! I thought Poochie was super cute. Still do. I didn't have one though. But I would have KILLED any 5 yr old little girl to get my own. I sorta kinda remember Poochie. I'm always amazed at your ability to find the retro commercials! soooooo many memories coming back... my sis loved Poochie! How did I not know about this when I was a kid? I would have loved it! I obviously did not watch enough television. Haha. Right. OMG, I cannot believe I forgot about this! I blame my biological mother for throwing away all of my cool 80s toys. Now, of course, it sounds naughty. Poochie? I am afraid I missed out on these. Man! I was ripped off! I had an obsession like this!!! Found you through Jesse at Not Worth Mentioning! oh my god! i totally remember these!! wow. I feel so left out! A toy only for girls?